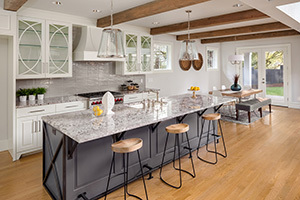 Much of a kitchen renovation is comprised of work behind the scenes: tearing out walls, rerouting plumbing, changing or adding electrical connections, rebuilding walls, and laying flooring. It isn’t until after the structural components are in place that the kitchen can really start to take shape. Cabinets and hardware, faucets and fixtures, and appliances and countertops all bring your kitchen’s personality to life. 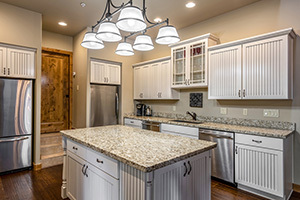 But before you can add character to your kitchen, you have to make a lot of choices: standard cabinets or open shelving, chrome or oil-rubbed bronze finishes, statement fixtures or pot lights, quartz or granite? 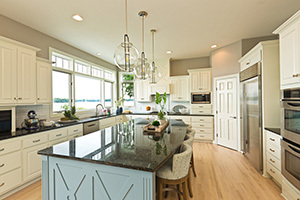 Renovation decisions can feel endless, but when it comes to selecting your countertops, investing some time upfront in understanding the differences, benefits, and drawbacks to quartz and granite is an important step to creating your dream kitchen. Do you have a high-use kitchen? If you have kids or do a lot of cooking at home, as opposed to eating out, you can’t go wrong with the durability of quartz. The man-made countertop is harder than granite, allowing it to stand up to drops and bangs from kids and frequent use. If you’re looking for form and function, the durability of quartz can’t be beat. Made from a mixture of resins, polymers and pigments, quartz, unlike granite, is also nonporous, which has three main benefits. Without places for bacteria to hide and with good kitchen hygiene, your tops can be bacteria-free. The nonporous surface also means the PB&J sandwich that sat out overnight or that drippy olive oil container won’t leave oil stains on the counter. The quartz manufacturing process also eliminates the need for countertops to be resealed, which is the case for granite. Is cost a factor in your decision? Trying to keep a kitchen renovation on budget can be challenging, with so many decisions to be made. 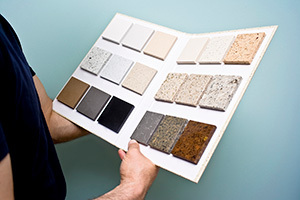 If you’re working within a tight budget or are looking to keep cost down on your counters, be aware that the different surfaces can vary wildly in pricing. While quartz often is considered more budget-friendly than granite, there are granites that cost less than quartz. However, some of the more exotic granites will have a higher price tag than quartz. This is where it’s best to look at options from both categories, and work with your contractor to determine which is a better fit for your lifestyle and budget over the long run. Will you be happy with a man-made substitute? Quartz is manufactured to look like granite. The depth of color and complexity of granite cannot be recreated in the quartz manufacturing process. While quartz can provide a wider color pallet with hues nature can’t create, quartz is engineered to look like its natural counterpart. Produced by Mother Nature, granite will always be the original and provides a unique look that can’t truly be duplicated. 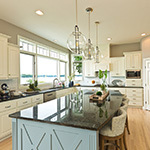 Granite and quartz countertops are both excellent additions to any kitchen makeover. Do your research. You’ll know which one is right for you based on your personal taste, budget and lifestyle. © 2019, Craftsmen Home Improvements, Inc. All Rights Reserved.